A Cake Leveler is an instrument used to level a cake. It is used to cut the cake into different layers and then fill those layers with the filling required. A levelled cake looks nice and presentable. It also makes filling the layers easier. Traditionally bakers have used serrated knives, but nowadays levelers are trendy tools for every bakery. A cake level is an essential item, and every baker uses it to make a cake look nice. Here we will look at the 3 best cake leveler. Wilton is the name to go to regarding anything related to confectionery. They are a well-known brand, and since 1929 they are the pioneers of baking instruments. They make very good quality cake levelers and other confectionery instruments. This cake leveler is one from its cost effective levelers suitable for residential use. A new and upcoming brand based in the UK is Knights Bridge PME. The cake leveler below is a versatile cake leveler made by them. It is good for small as well as big 46 cm cakes. It has an all steel body and a serrated knife to easy cake torting. ForeverSmooth 12-inch cake turntable comes with a leveler, decorating supplies kit with four side icing bench scraper, offset spatula, lifter board, and reticent rotating stand. It makes it easy to decorate large cakes, now you can easily reach those hard sports without breaking your wrist and neck. With this cake turntable, you can easily frost, trim and comb your icing perfectly all around the cake with this ForeverSmooth cake turntable. 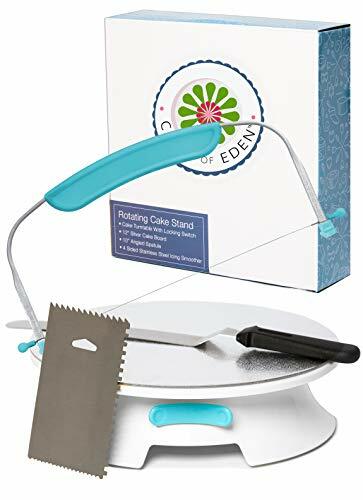 The cake turntable is made with high-quality and durable ball bearings that make the stand stay strong without any noise or wobbly while turning the cake turntable. The product offers a guarantee for lifetime. This cake turntable is a perfect choice if you love to decorate cakes and take it to the next level. ForeverSmooth 12-inch Cake Turntable is made with pending-patented ball-bearings for silent 360 and smooth rotation. Great for right and left-handed decorators. It contains a locking brake that makes it easy to lock the table in place, it is a useful feature especially when you want to write letters and put delicate flowers. The turntable can be sued for display or serving. The 10-inch stainless steel offset spatula that you can use to coat the cream and apply it smoothly all around the cake with ease. The ForeverSmooth cake turntable offers a bonus 12-inch silver cake board in the pack. 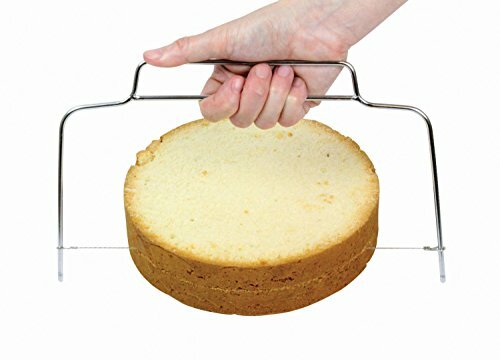 With this cake board, you can easily transfer the cake if you do not have cake lifter. 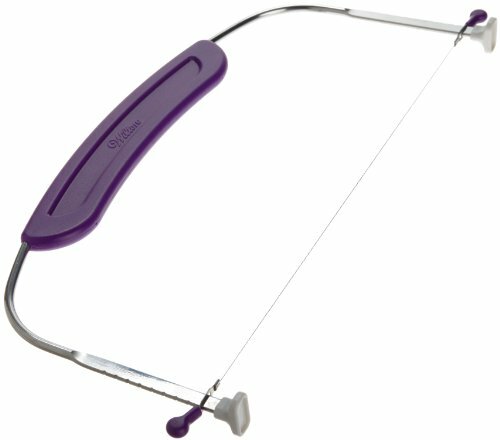 Leveling cakes may be something new for many, so the correct cake leveler needs to be purchased. Serrated blades leveler suits some and some find themselves more comfortable using the wire leveler. Both have their merits and demerits, and it’s essential that they are studied in details before purchasing one. The looks of a leveled cake are beautiful and when sliced and can turn a first-time cake maker look like a professional baker.